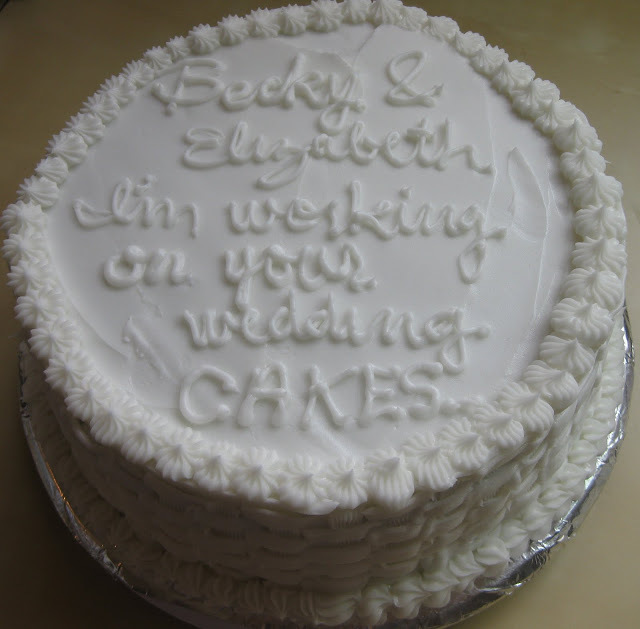 The Tasty Memoir: Found a Baker for my Future Wedding? So... I'm stuck in a self imposed dungeon (my desk or the library desk) most days till about early October. However, I do allow myself some time to check email and follow up with blogging stuff before I get into the grind. The other day I opened up my Gmail and one of the emails was from a good friend at work, E.Ho with the above photo attached. I was so confused... did she happen to find a photo of a cake with BT's (our mutual friend at work) and my name? She then divulged later that day that she's taking a cake decorating/baking class. And ... her goal is to make a 3 tiered wedding cake!!! I've been asked to start thinking about my potential flavor combinations. Ideas anyone? The penmanship isn't too bad yea? So I guess I've found a baker for my future wedding? She's working on fondant and gum paste decorations too! I'm hoping for something lovely.